In a statement today, the U.S. promised it will not produce or acquire antipersonnel mines but fell short of joining the Mine Ban Treaty. It gives us great relief that the U.S. is banning the production of these deadly weapons. Handicap International welcomes today’s Obama Administration statement, promising the United States “will not produce or otherwise acquire antipersonnel mines not in compliance with the (Mine Ban) treaty.” The U.S. Ambassador to Mozambique, Douglas Griffiths, read the U.S. statement today at the Third Review Conference to the Convention on the Prohibition of the Use, Stockpiling, Production and Transfer of Anti-Personnel Mines and on their Destruction. The statement lists a number of steps the U.S. will take to "ultimately allow us to accede," he read, to the landmark treaty banning anti-personnel landmines. "It gives us great relief that the U.S. is banning the production of these deadly weapons,” said Elizabeth MacNairn, executive director of Handicap International U.S. “To hear them speak about accession to the treaty as a foreseeable goal is a cause for celebration. We feel one step closer to joining the world community–161 other nations–in banning this deadly weapon. 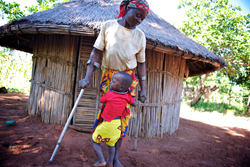 Landmine victims and their families around the world are ready for the U.S. to accede to the treaty." However, the statement failed to provide clear deadlines about when President Barack Obama might submit the treaty to the United States Senate for ratification. “By not setting a firm date to complete this task, the U.S. runs the risk of allowing its landmine policy review to drift beyond President Obama's term in office as president," MacNairn added. The statement also fell short by not committing to a full ban of the use of anti-personnel landmines. According to the statement, "The United States will not produce or otherwise acquire any anti-personnel munitions that are not compliant with the Ottawa Convention in the future, including to replace such munitions as they expire in the coming years. Meanwhile, we are diligently pursuing other solutions that would be compliant with the Convention and that would ultimately allow us to accede to the Convention. We are also conducting a high fidelity modeling and simulation effort to ascertain how to mitigate the risks associated with the loss of anti-personnel landmines. Other aspects of our landmine policy remain under consideration, and we will share outcomes from that process as we are in a position to do so." The statement is not the outcome of a five-year-old, policy review that President Obama began in 2009, but rather an 'initial announcement', a U.S. delegate told campaigners from the U.S. Campaign to Ban Landmines in Maputo. Importantly, this language reverses the 2004 Bush policy statement, which suggested that the U.S. would never join the treaty. Today’s announcement brings supporters of the Mine Ban Treaty one step closer to a good result, but without clear or immediate action deadlines, there is room for concern. For more than 20 years, the U.S. has refrained from using or trading antipersonnel landmines. The country also hasn’t produced new landmines since 1997. It is by far the world’s largest donor to projects that reduce the threat of landmines and explosive remnants of war, with $2 billion spent on mine action since 1993. Yet the U.S. has continued to stock millions antipersonnel landmines, and failed to join the 161 countries that have banned the use, production, trade and stockpiling of antipersonnel mines, while aspiring to the treaty’s other obligations. This vague position could serve as carte blanche for other major powers, such as China and Russia, to remain on the sidelines of this life-saving treaty. U.S. reluctance goes against the actions of countries working hard to progress in the fight against landmines and their devastating consequences. Global funding for action against mines reached $681 million in 2012, after a decade that saw clearance or survey work release nearly 2,000 km2 [772 square miles] of land from mines. As of June 2013, nearly 30 States Parties to the treaty have finished clearing mines from their territories, and 87 States Parties have destroyed more than 47 million stockpiled mines. By working to acceding to the Ottawa Treaty, the U.S. confirms that these standards are essential and sets an example to follow. Handicap International urges powers like China and Russia, which along with 33 other countries have not signed the treaty, to follow the American example. Handicap International will work to encourage U.S. authorities to achieve its goals in the months ahead. The charity runs or supports anti-mine projects in 33 countries, returning land to communities through demining, teaching people to spot, avoid and report explosive remnants of war through risk education, and providing support and care to victims of landmine. The organization works to raise the visibility of these landmine victims and their communities, so that the world is reminded of the scourge of landmines.